My Nana’s famous recipe for Cherry Cheesecake – it’s incredibly delicious and the staple dessert at every single family function. Ever since I was small child, I remember being in the kitchen cooking and baking with my family. From shredding cheese for dinner on a box grater with my mom – which, but the way, resulted in a still-visible scar – to being perched on a stool rolling pumpkin rolls for holiday gift giving. In fact, those face-to-face moments spent with my loved ones are some of my most cherished childhood memories. And that connection is something that I try to share with Elle and Eric everyday. Although Elle is only 8 months old, we try to always involve her in the baking and cooking process. Whether she is in her carrier on my back or sitting in her high chair gnawing away on a carrot while we prep dinner, she’s involved and taking in the process and the connection every step of the way. One of my favorite memories as a child was making my Nana’s famous cherry cheesecake recipe. I loved pressing the crust layer into the bottom of her baking pan. She always put me in charge of spreading on the cream cheese and cherry layers – watching me like a hawk, so I wouldn’t lick the wooden spoon. 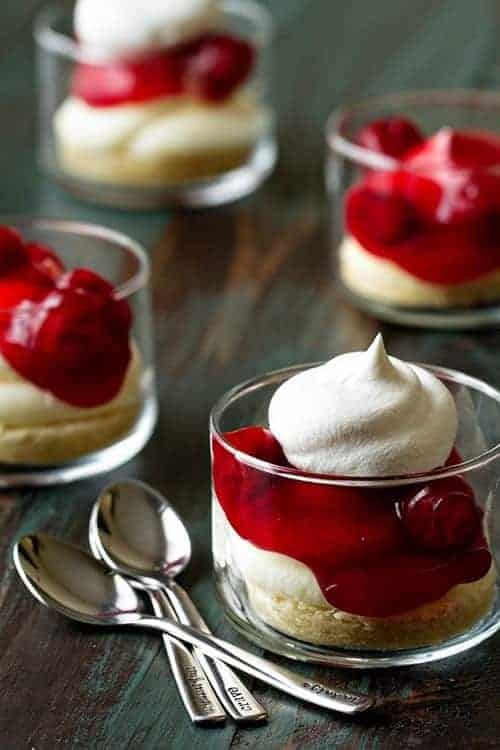 When the cherry cheesecake was complete, we’d always steal little bites from the corners and cover the missing spots with extra whipped cream – it was our little secret! I started sharing retro recipes here on My Baking Addiction as a way to connect with my childhood and more importantly publish the recipes in one place for my family. I can’t wait for Elle and I to be able to create these recipes in our kitchen together and create a whole new set of face-to-face moments that we’ll cherish forever. One of the things I’m most looking forward to is encouraging her little mind to be creative with these tried-and-true recipes. I can’t imagine what she’ll come up with, but innovation is innovation, whether it comes from a 30-something with a hankering for cheesecake and enough sense to know she needs it in single-serving containers, for from a little girl who understands that the world of food is at her beck and call – with Mama by her side to make it happen. 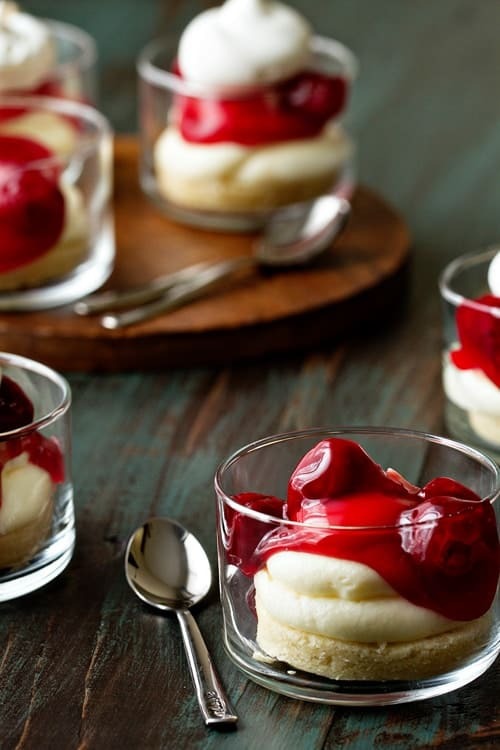 This cherry cheesecake recipe is not only simple to make, it’s also incredibly delicious and the staple dessert at every single family function – from cookouts to Christmas, we love getting into the kitchen and recreating a recipe that was part of our lives for so many years. It’s a way to connect with our past, but also new memories. 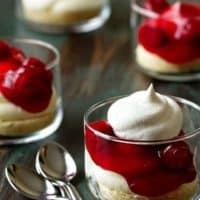 I decided to serve Nana’s Cherry Cheesecake in a fun new way by cutting the crust and layering the rest of the components into individual glass dishes. This is simply my attempt at a little modern twist, but trust me, it’s just as delicious scooped directly out of the pan. Preheat oven to 350°F;. Line the bottom of a 9x13 inch pan with parchment paper. In the bowl of a stand mixer fitted with the paddle attachment, or in a large bowl with an electric mixer, cream together butter and sugar for about 2 minutes. Add in flour and mix on low speed until combined. Evenly press dough into the bottom of prepared pan. Bake in preheated oven for 15-17 minutes. Do not over bake. Remove pan to cooling rack and allow crust to cool completely. Once crust is cool, prepare the filling. In the bowl of a stand mixer fitted with the paddle attachment, or in a large bowl with an electric mixer on medium speed, beat together cream cheese and confectioners' sugar for about 3 minutes. Add in vanilla extract and beat an additional minute. Evenly spread filling over cooled crust. Top with cherry pie filling and refrigerate for at least 4 hours before serving. If desired, top with whipped cream or whipped topping before serving. I decided to serve Nana's Cherry Cheesecake in a fun new way by cutting the crust with a biscuit cutter after it was baked and cooled. I then layered the rest of the components into individual glass dishes. Individual glass dishes were purchased from Pier 1. Spoons are from The Vintage Pearl. I love classic recipes! Especially when they are family recipes. These little cheesecakes are adorable. Swoon! Gorgeous. Recipes from Nana are the best! Thanks so much, Katrina! I appreciate you stopping by! They look gorgeous. And just look at that red! Thanks so much, Nazia! I appreciate you stopping by! Did I miss where the vanilla goes? Nope, but I sure did! I’ll update the recipe. Thanks so much for bring that to my attention, Melinda. Thanks for stopping by! Thank you Jamie. I figured that was what should be done but I tend to follow recipes exactly so I just wanted to make sure. Sounds delicious! What awesome memories for you to hold on to and look forward to passing along to your daughter. I know she’ll cherish them as much as you do. 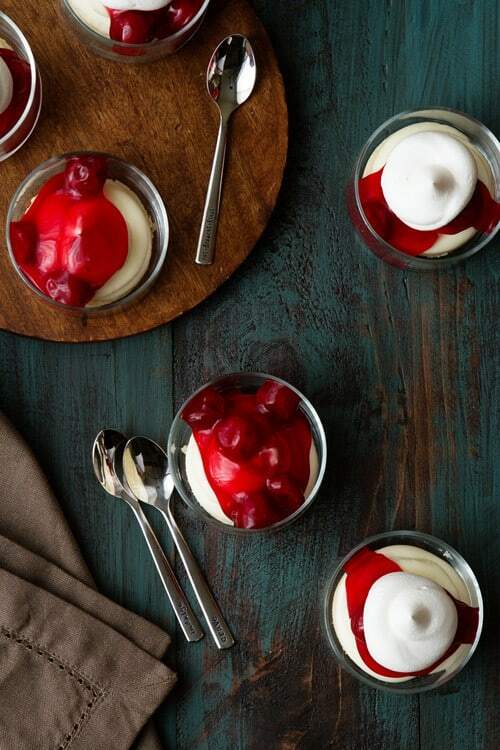 I gotta say, I love those little glass ramekins as much as I do the cheesecakes. Thanks so much for stopping by, Christiane! Classic recipes are so sentimental. And delicious! I couldn’t agree more. Thanks so much for stopping by! Cherry cheesecake… sounds like a slice of heaven! Loving these gorgeous desserts! I made these for a party. I didn’t have cherry filling, so I used strawberry. I put them in individual bowls so everyone thought it was strawberry shortcake until they got to the surprise layer. Needless to say they were a big hit. I’m so happy to hear that Lorraine!